Get smooth, silky and shinier looking hair using the Bronson Professional Simply straight brush. It is the quickest and easy way to get salon quality, perfectly straight hair. All you have to do is glide simply straight through your hair slowly like a regular hairbrush, for beautifully smooth, straight hair in just minutes. The secret is in the special ceramic-coated bristles heat up to just the right temperature to gently relax hair as you brush leaving you with silky smooth straight hair in just minutes! 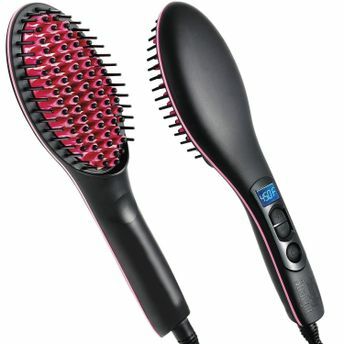 It combines the power of a flat iron with the gentle styling of a brush, perfect for any hair type and length. Simply straight gives you perfectly straight, salon-quality results in just minutes, with no flat iron damage, no chemicals, and no hassle. Additional Information: Straightening your hair is now as easy as brushing it! Bronson Professional Fast Hair Straightener leaves your hair looking silky smooth with brilliant shine all day long. Explore the entire range of Straighteners available on Nykaa. Shop more Bronson Professional products here.You can browse through the complete world of Bronson Professional Straighteners .